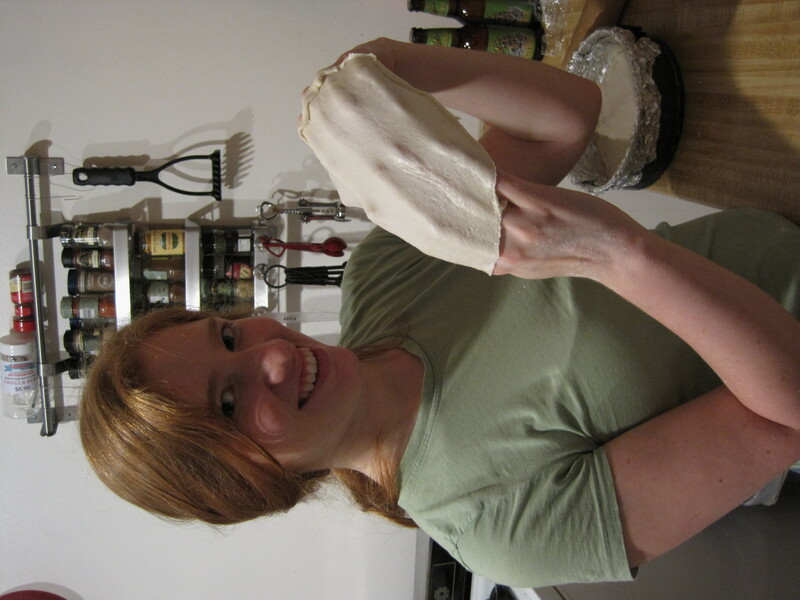 I was a little daunted by the idea of making my own phyllo dough. 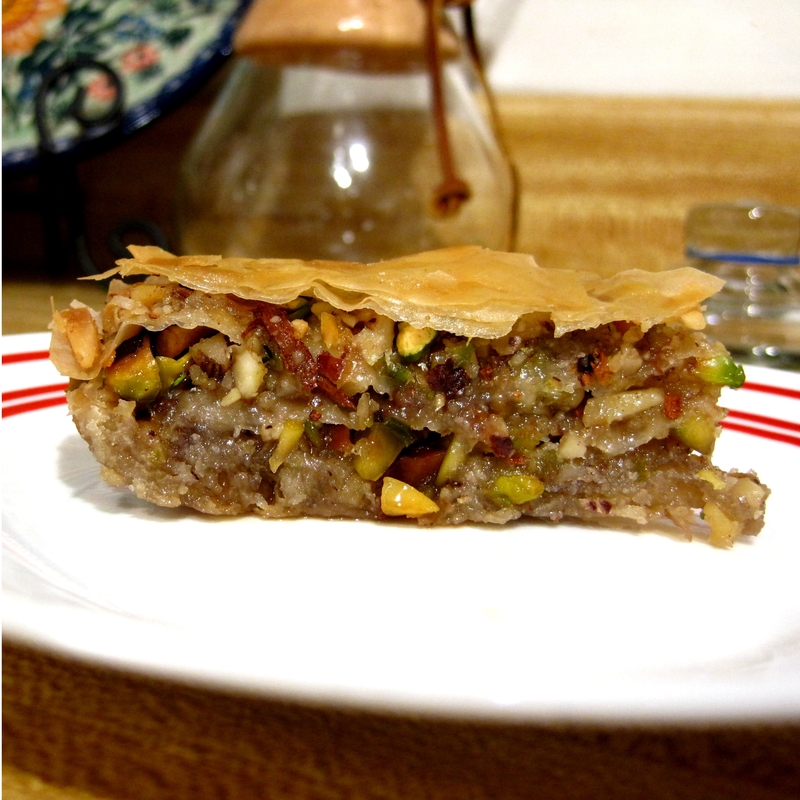 Even Alton Brown doesn’t make his own phyllo dough when he makes baklava. I have now made something more from scratch than Alton Brown. But I did decide to compromise. I made the bottom layer myself and used store bought dough for the rest. I also tweaked the classic recipe by making mine round and using maple syrup instead of spiced honey. I liked the idea, but I don’t think the spices that you mix in with the nuts complement the maple flavor that well. I doubt it’s the cinnamon, so it’s probably the allspice or the clove, or both, that’s not playing nice with maple. That didn’t stop my friends from enjoying it, though. The dough got pretty thin and translucent. The full recipe is here. I’ll just add a tip for rolling out the phyllo dough, if you are ever possessed to do this yourself. It’s not as hard as you’d think, and you can use a regular rolling pin even though they suggest a wooden dowel. 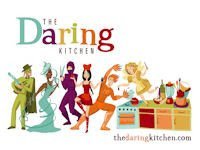 But when you roll out dough, you create new surface area, and so even though you floured the dough and the counter, you still get sticky areas. If you’re rolling out something this much, you have a lot of sticky area. So I tried buttering my work surface instead of flouring it. After rolling a piece, it came right off of my counter instead of needing a lot of gentle prodding like before. 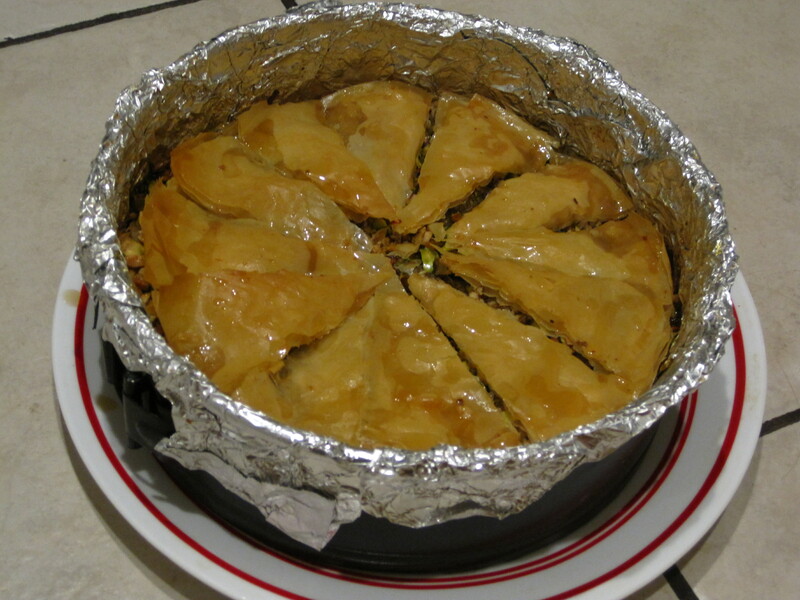 And then I had a head start on the buttering that you do to make the baklava. I only baked mine once, for about 30 minutes, whereas the recipe has you do that twice. Mine probably could’ve used some more time in the oven, but I think another full 30 minutes would have been too much.